Conned into Looking Forward to the Past! Every year I try to pop along to watch Basingstoke Town play football. It is my own way of trying to show a bit of loyalty to what is known as ‘grass roots’ football. When I turned up on Saturday, nothing had changed and apart from the big screens showing multi-millionaires playing the same game 50 miles away in Bournemouth, going into The Camrose is like walking back into 1978 and that’s the way they like it. I do too. You can tell the people in there seek comfort in the past, a time that they perceive as a working class era where everything was better. The Camrose Social Club is the type of place that would welcome a reverse of the smoking ban with open arms. Virtually all manufacturing in Basingstoke has gone and whilst the town has moved into an era of glass buildings and financial services businesses with names like Synergy and Optimum, the Camrose remains a source of 1970’s comfort, for now at least. When I walked around the ground and stopped in the bar for a pint of Double Diamond (not really, it was actually Doom Bar) I realised where all these Brexit opportunists like Farage, Banks and Johnson, had got their votes. These people are essentially decent and honest but before 2016 they would have barely known the EU existed, bar the odd ‘UP YOURS DELORS’ headlines in The Sun newspaper. For them, as should be the case with all of us, it should have been the politicians jobs to deal with any reformation of the EU via vetoes, not a referendum. The globalist tax avoiding crowd knew this and they also knew that they could weaponize these folk by playing on a fear of the destruction of the NHS and uncontrolled immigration affecting their job prospects. This was their big and perhaps, final chance. It worked a treat but the direction we are heading in is a million miles away from rescuing the NHS with £350 million a week or the saviour and indeed recreation, of manual jobs in factories. We are walking into what will quickly descend into a race to the bottom in a country where every public service will have a price. This should have become obvious yesterday on the Sunday Politics Show, but Andrew Marr fluffed his lines and got tied in knots as Arron Banks (brilliantly it has to be said) muddied the waters and the whole interview became confused and largely irrelevant. Whether the NCA (National Crime Agency) can deal with this better than Andrew Marr, who sadly failed as a political journalist, remains to be seen. However, the missing of an open goal has given Banks vital time when he could have been on the run. If the likes of Banks, Rees Mogg, Liam Fox and Boris Johnson get the Brexit they are looking for, for the fans of Basingstoke Town who voted for a return to the past will be in for a shock. The eventual bulldozing of the Camrose in 2019 will be a tragic metaphor for their dreams, as workers rights disappear and the NHS goes up for sale. Some more vindictive folk say they get what they deserve but I find it kind of tragic that decent people will be getting the polar opposite of a deluded nostalgia vote for a return to an era that has gone forever and was never as good as our memories con us into believing anyway. British folk are strange when comes to longing for the past. Even in the 18th Century, John Constable painted pictures of a glorious bygone era that didn’t exist. What on earth is wrong with looking for a better future? Closer inspection will tell you that nostalgia never has been as good as it used to be. 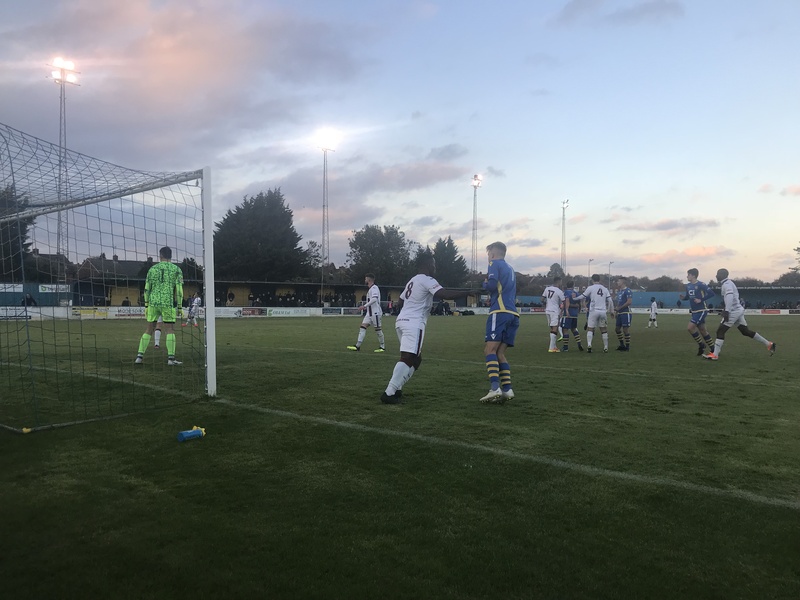 *Basingstoke lost 2-1 but there was a kid on the pitch called Sam Smart who looked head and shoulders above anyone else on the pitch. No Replies to "Conned into Looking Forward to the Past!"